Menny Barzilay is the CTO of the Interdisciplinary Cyber Research Center at the Tel Aviv University, is a member of the Yuval Ne'eman Workshop for Science, Technology and Security Senior Forum and is the CEO of FortyTwo. This story began when I was giving a TV interview about a recent incident where police in the U.S. obtained a search warrant for an Amazon Echo owned by a murder suspect in the hopes that it would help convict him — or at least shed light on the case (the case is not relevant to our story, but here’s an article about it, anyway). The day after my interview, several people told me that every time I said “Alexa” on TV (and, as you can imagine, I said it several times during that interview), their device turned on and entered a waiting-for-your-commend mode. It took me a few seconds to grasp the meaning of what they had just told me… and then I had one of those OMG moments. This is exactly the kind of thing I love to hear. Immediately I started planning what I would say to mess with Echo owners who were unlucky enough to be watching the next time I was on TV. Actually, I don’t even need them to watch — I just need them to leave the TV on. In the process of learning more about Alexa’s capabilities, I found an extensive list of commands that work with Alexa; I also consulted several Echo owners. This would definitely create some interesting situations. As I started getting more into the Echo command possibilities, I realized there is an interesting attack vector here — and it is bigger than messing with people over the TV. Many use Echo to add items to their to-do list, their schedule, their shopping list, etc. Advanced users also can install plug-ins that connect Alexa to other resources, such as their Google Drive and Gmail. As expected, Echo also can retrieve these items and read them out loud. And because Echo has no user identification process, this actually means that anyone within talking range can get access to Echo users’ sensitive emails, documents and other personal data. The world of IoT was destined to introduce problems of a new type. And here they are. And it goes on. Alexa has a kit that allows it to control smart houses. There are alarm systems that you can turn on and off with voice commands and, in some cases, even unlock the front door. The fact that Alexa doesn’t identify users means that for “her,” all us humans are the same. Actually, you don’t even need a real person to speak. In an experiment that we’ve made, we controlled Alexa by using a text to speech system, and it worked wonderfully. 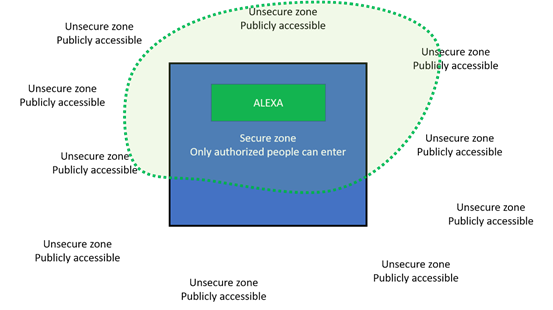 Though other companies have introduced personal helpers, Alexa is unique in the sense that it is open and has many interfaces and plug-ins. Even Hyundai integrates Alexa in some of its cars, which means you can control its locks, climate, lights and horn, and even turn it on with voice commands. But there is a much greater issue here. 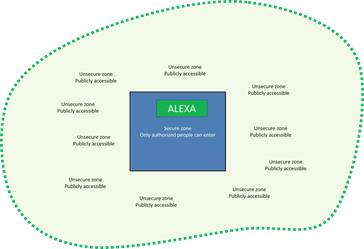 And it relates to the fact that placing an Echo device in a physically secured environment does not actually mean that threat actors cannot access it. Until now, we have (generally) divided the world into two sections: secured areas and unsecured areas. And we had straightforward means to facilitate the separation between the two: walls, barbed-wire fences, gates, guards, cameras, alarm systems, etc. Wi-Fi networks suffer from a similar problem. Companies that wanted to implement Wi-Fi networks had to deal with the fact that they might be accessible from outside their physical office. But with Wi-Fi, we had a simple solution — encryption. This is obviously not relevant to voice-operated devices. You cannot encrypt the conversation between the user and the device. Or can you? No, you can’t. Nevertheless, an obvious solution to this problem is to integrate a biometric vocal identification system in Alexa. If done, Alexa could just ignore you if you are not an authorized user. But this is not an easy thing to accomplish. Even though the world of biometric vocal identification constantly innovates and improves, there are still challenges and vocal identification solutions are still struggling with a bad false positives versus false negative ratio. And then there is Adobe’s VOCO. This amazing application can actually synthesize human voices (watch the demo video). So there is nothing that can be done? There is always an inherent trade-off between security and user experience. You can set up Alexa to only operate when you press a button, but that makes no sense. Well, at least Echo doesn’t have a camera integrated into it. Yet. Bottom line, Amazon and other vocally controlled device manufacturers will have to integrate vocal identification in the years to come. Funny enough, after starting to work on this article, a TV anchor accidentally said “Alexa, order me a dollhouse.” And it did. For many people. Call for action: If you are an entrepreneur, build a startup company with a product that solves this issue (vocal firewall?). Sell it to Amazon. Make billions. Thanks to all Amazon Echo users who help in the process, and specifically to Uri Shamay. If you are unconvinced that vocal identification is a complicated thing, you can watch this video. Or this one (warning: explicit language! ).